They’re also one of the original skinned boots. The internal shell of made of a solid plastic with a fabric skin providing protection and fit. The soul plates are part of the skin, and are what holds the boot together. I took them to my local skate park to see how the feel. After my first session, I realized the insole needed to be changed for me to enjoy the boots. Being a raised heel boot, the New Jacks have a built in forward lean. Because the stock insoles are much thicker on the heel, it makes you feel like you’re leaning forward even more. I tested a dozen insoles and found that the best ones for me were the one from my Valo v13. The Envelop gel insoles were also pretty good, but moved around a bit. After switching out the insoles, I got comfortable with the skates. I skated them for another month with some 50/50 Balance frames and really enjoyed the way they felt. I got so confident, I even learned Kind grinds. 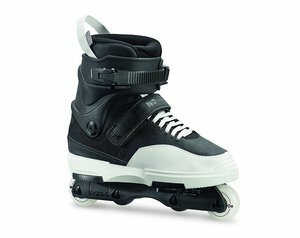 The Rollerblade New Jack are a great skate, and an incredible deal at $200. The boot is really well built and the stock hardware are good enough for most skaters. Are these the best $200 skates? Probably so. The stock insoles created too much of a forward lean for me. I’ve seen people have returned the skates due to this design. Swapping them out is really easy though, so it’s not a deal breaker. The stock frames and wheel setup are fine for skating anti rocker, but would be difficult to skate flat without wheel bite. I suggest upgrading the frames and wheels when you can. The backslide groove is fairly deep and off center creating an angled royale. This might be OK for some people, but I prefer a straight line royale. This boot is probably supportive enough to ride with a big wheel setup. I set them up with some Kizer Trimax frames and plan on testing them out in the coming weeks. Overall though, the Rollerblade New Jack are an incredible bargain at $200. Swap out the insoles and you’ve got an amazing skate. If you're interested in picking up a pair of Rollerblade NJ Team, and don't have a local skate shop, consider using our Amazon affiliate link. We'll get a small percentage of the sale and it'll help support Back to Blading.